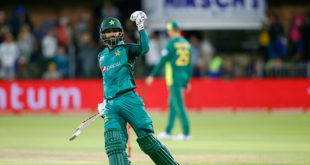 LONDON: Shadab Khan turned the heads yet again, picking up 10 wickets for his side against Northampshire, as Pakistan cruised to a nine wickets victory in their second tour game. With an impressive tally of 10 for 157, Shadab also etched new records as the 19-year-old became the youngest leg-spinner to take 10 wickets in a first-class match in England in 91 years. As per local media reports, New Zealand leggie Bill Merritt achieved similar feat back in 1927. Furthermore, Shadab also became the second youngest Pakistani after Waqar Younis to take a 10-wicket haul in first-class cricket in England. Chasing 133, Sarfraz XI comfortably chased the target in 27 overs on loss of a wicket. Imam-ul-Haq batted beautifully for his unbeaten 59 while Haris Shoail scored 55. Azhar Ali was run out after scoring 10. 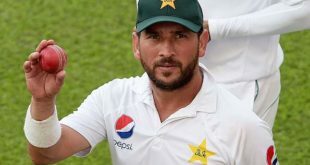 Pakistan will play against Ireland, which will be their first-ever Test against Pakistan from May 11 to May 15 in Dublin. Pakistan will then play two Tests against England at Lord’s from May 24 to May 28 and Headingley from June 1 to June 5.